I am asking you to pause to pray for one of our members, Bruce Clark. Last week Dr.'s discovered an 11 cm cancer on his kidney. Today at 9:15 he has surgery to remove the tumor, and they will also check to see if their are any other cancers in the region. Also, lift up his wife Sue and three kids Emma, Anna and Robert. 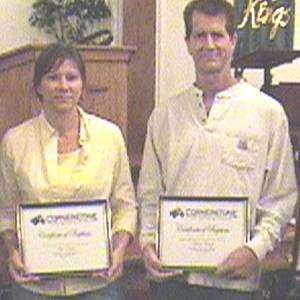 Here is a picture of Bruce and Sue following their baptism last fall. I will try to post later today and give an update. I just got back from visiting Bruce at the hospital. The surgery was successful and he is in great spirits. Please continue to keep all of them in your prayers. Please forget about the church service; really!